Ten Foot Pole's upcoming Victory Records debut, "Bad Mother Trucker", provides longtime fans and the soon to be converted with socially conscious, fast, hard punk. Ten Foot Pole's sound is more straight and to the point than their Orange County scene-mates. Aggressive, though not too serious, the band's sound sits comfortably in the tradition of American punk rock, emphasizing the dynamics and speed of the talented musicians that make up this longstanding punk rock tradition. I love this album. 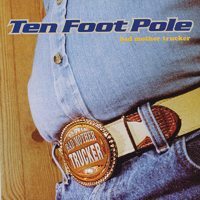 This is the first Ten Foot Pole CD i've bought. All of the songs are really great, and I'm not exaggerating. The only thing that gets annoying is that the vocalist sings through his nose, if you know what i mean. It might get irritating after a while. But I'd recommend this to anybody who likes punk. Definitely a good album. Just Ten Foot Pole as you know them. If you liked Unleashed and Insider, like I did, then you will most likely enjoy this cd too.